In late January, at the end of her middle school grading period, Dijhena walked in the New Columbia Community Building Office. She said hello to Ashley Brown, who is not only a role model for Dijhena, but for many other teen girls in New Columbia. Ashley leads CREW, a youth empowerment program for teen girls and boys. After Ashley gave her a hug and asked how classes were going, Dijhena proudly pulled out her honor roll certificate! 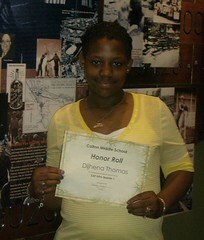 Dijhena stated she received a 3.87 grade point average this semester. Dijhena not only thinks about working hard in school, but is already planning for her future. I want to be a college professor, she says while she carefully tucks the honor roll certificate back into her backpack. English is my favorite subject, so I want to be an English professor. Dijhena attributes her academic success to her family. My grandmother, aunts, mom and sister support me. I know that all of my family members have a job, and its my job to study hard and do well so I can get a scholarship to help pay for college. Dijhena is not only active in the classroom, but knows the importance of taking an active role in her community. She helps with the distribution of the New Columbia Neighbor community newsletter, organizing the summer concerts in the park, CREW Academy fundraisers and various projects to help New Columbia. She is highly engaged when she is in CREW. Shes open, honest and willing to talk about topics we cover. Way to go, Dijhena, we are proud of you!